So 2016 is just two days away. What a year 2015 has been for Butterfly Barn! Little did I know that Butterfly Barn would bring my family and I on such a wonderful adventure. I have met so many kind and fascinating people who are following their dreams and helping others to follow theirs. It is truly heartening and I am very grateful that my writing has touched people in the way that it has. Thank you for all the social media messages, emails and private messages I receive, your encouragement keeps me going. I believe that Butterfly Barn has brought my second novel On Butterfly Wings to new heights. 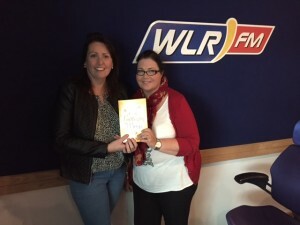 In the week On Butterfly Wings was launched it reached no. 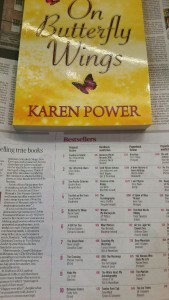 5 in the Irish Times Best seller list. I hope you enjoy the attached video of the book launch. Mayor of Waterford City and County Council, Cllr. John Cummins launched On Butterfly Wings at The Book Centre, Waterford and it was an incredible honour that 65 copies of On Butterfly Wings were purchased by the Council to gift to visiting dignitaries to my home city, Waterford. Over the past year, I have been invited to speak at many events, host book signing, guest blog, speak on radio, feature in newspaper and magazine articles and it is all thanks to you, the readers, for your loyal support. Some day a place called Butterfly Barn will exist for real, but for now I will keep on writing and hope that you will all keep reading. Watch out for my first 2016 blog on Monday 05th of January. Again thank you all so very much.